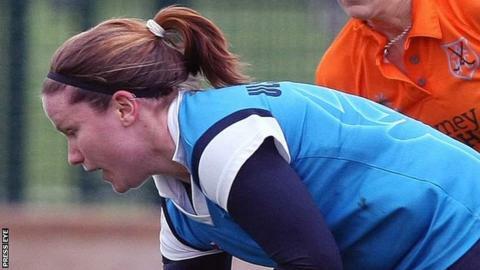 Ulster Elks' chances of staying in the Irish Hockey League are under threat after they suffered a 6-1 defeat by Monkstown at Jordanstown on Saturday. Pembroke Wanderers' win over Ards did not help the Ulster side's chances. With just two games remaining the gap between the bottom clubs is four points although Pembroke and the Elks do meet on the final weekend of the season. At the top UCD maintained their one-point advantage over Monkstown with a comeback victory over Cork Harlequins. Chloe Mitchell's goal was merely a consolation for the Elks as they were trounced by Monkstown and they face the daunting task of beating Loreto and then hoping that gives them the opportunity of catching Pembroke Wanderers. Their cause wasn't helped when a Eanna Horan goal was enough for Pembroke to beat Ards 1-0, a result that ended any outside hopes the County Down side had of reaching the play-offs. Indeed Pembroke have crept to within three points of Belfast Harlequins in the battle to avoid the relegation play-off. Harlequins went ahead twice at Pegasus through goals from Amy Geddes and Gemma Frazer, only to be pegged back by two Ruth Maguire strikes but the 2-2 draw may yet end up being a vital point for the Belfast club. UCD came from 3-1 down to third place Cork Harlequins to win 4-3 with Deifre Duke scoring twice and the other goals scored by Sorcha Clarke and Abbie Russell. The victory kept them a point clear of Monkstown who have a game in hand but with the two sides, neither of which have lost this season, scheduled to meet on the final day, the destination of the women's IHL title is likely to go down to the wire. With UCD, Monkstown and Cork certain to reach the play-offs the final place will go to the side that finishes fourth and Loreto moved a big step towards clinching it with a 3-2 win over their nearest challengers Railway Union.